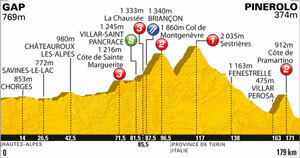 Today's Tour de France stage 16 was a pure pleasure, it had all the elements of great racing, with many riders motivated to get in a break, a chasing peloton, a tough final climb that made a big selection, and a nasty descent which enabled Thor Hushovd to win from the break and Cadel Evans to take time on all the GC contenders. For me this was the stage of the Tour so far; if you haven't watched the Tour and want to watch one stage, make it this one. Alberto Contador roused himself to make some great attacks, and broke clear of the Schlecks and some other contenders like Ivan Basso, but couldn't shake Evans and Samuel Sanchez, who seem to be the strongest climbers this year. And Thomas Voeckler continues to amaze; not only was he in the mix all through, but even answered a couple of Contador's attacks himself before losing a little time in the end. He is truly a worthy yellow jersey wearer and I look for him to keep it again tomorrow, only to lose it on the Galibier Thursday. We'll see. By the way there were two Norweigens in the race, Hushovd and Edvard Boessen Hagen, and they finished one-two. What are the odds of that? And kudos to Ryder Hesjedal who led the break up the climb and then worked perfectly with Garmin teammate Hushovd on the descent to get the win. Tomorrow's stage is similar to today's, with perhaps more climbing; it is interesting that they have the intermediate sprint after a cat 3 climb, which may allow Philippe Gilbert or perhaps Hushovd to take points from the pure sprinters like Mark Cavendish and Jose Rojas. And then we have a serious cat 1 climb into Italy before a long long long descent and then a final cat 2 climb before a descent to the finish. It could definitely be another day for a breakaway, much like today, as well as a day for a selection on GC, much like today. Stay tuned!